For various reasons, Corey and I are squidgy about sleepovers. So the year Natalie begged for a sleepover birthday party, we parried and suggested a faux sleepover. "All the fun of a sleepover without all of the squealing at 1:00 AM!" Our thought was: she could still have friends over, make crafts, eat pizza, be silly, have a pillow fight and watch a move while wearing pajamas. But instead of sleeping at our house (which at the time wasn't even 2000 square feet and was already holding six people), the party would end at 10:00 PM and everyone would go home and sleep in their own beds. Natalie grudgingly accepted our counter-proposal. And so we threw a faux sleepover birthday party, with a little stuffed animal fun thrown in for extra points. Because we wanted to merge our themes, Natalie and I created mini sleeping bags for the invitations. We dug up some double-sided paper from my long-neglected scrapbooking stash (remember scrapbooking?) and cut them into rectangles. We glued the edges together, leaving an inch at the top of the front so we could fold the "sleeping bag" down. I created the invitation using desktop publishing software; the key was to measure the inside of the sleeping bag and keep my text square small enough to fit easily. 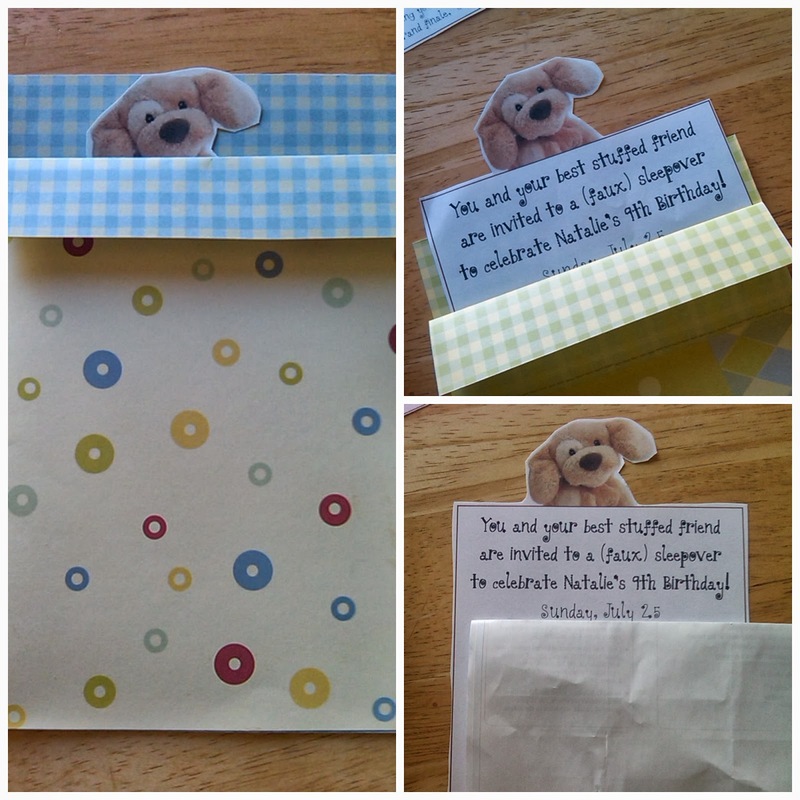 Then I added a stuffed animal head to the top of the text box, just the right size to stick out of the folded down flap and encourage the guests to slide the invitation from his cozy home. Because Natalie's favorite stuffed animal is her beloved Kipper, we chose to make puppy cupcakes for the party. 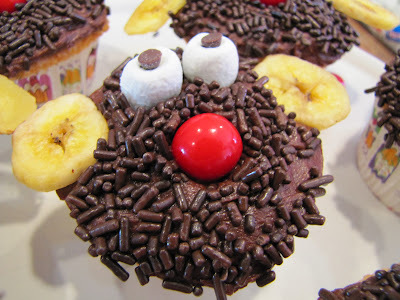 We covered chocolate icing (probably this one) with chocolate sprinkles. Mini marshmallows stuffed with mini chocolate chips served as eyes, a red gum drop stood in for a nose and banana chips made perfectly floppy big ears. We tried our best to mimic a real sleepover. The girls came over in the late afternoon, with their favorite stuffed animal in tow, as directed by the invitation. 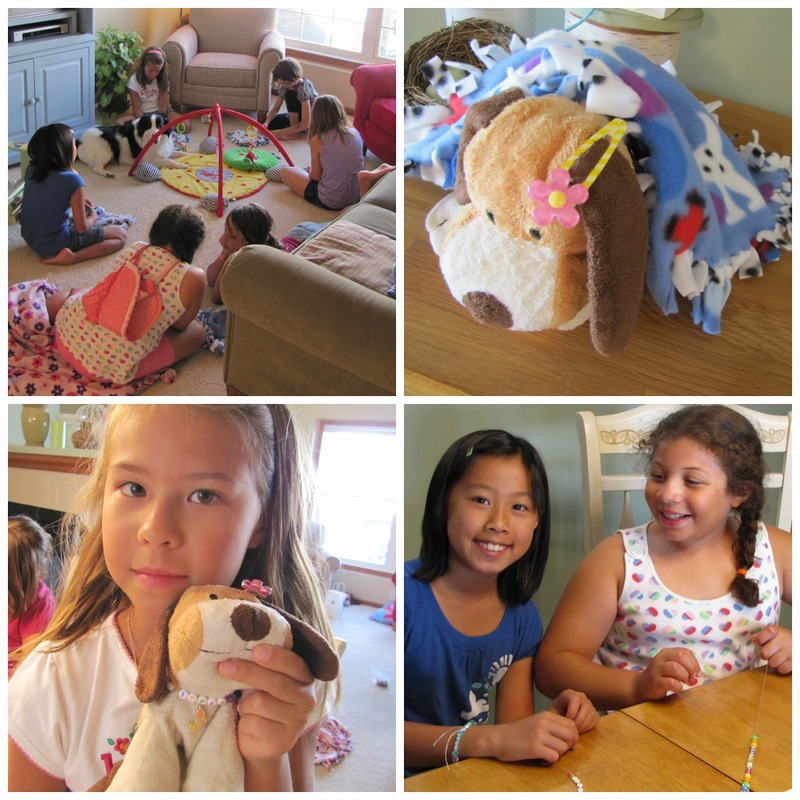 We focused our crafts on the stuffed friends: the girls tied tiny fleece blankets and customized beaded necklaces for them. The girls also decorated frames which I filled with a picture of them and Natalie (taken as soon as each guest arrived). Of course, we ate pizza for dinner and let the girls hang out in Natalie's room for a bit, just giggling and talking. Then everyone changed into pajamas and settled down to watch a movie to finish the evening. And lo, when the magic hour of 10:00 PM arrived, the guests' parents arrived to transport them home. All of the flavor of a sleepover without any of the nasty after-taste.